Christmas is still over two months away, but it’s never too early to keep an eye out for cool smart home gifts. Between now and the end of October, I’d like to call attention to some of the more innovative products that come across my radar screen—here’s round 1 of these unique and useful solutions. Netgear, the manufacturer of the popular Orbi line of mesh networking products, recently announced the Orbi Voice—a WiFi satellite that includes a high-performance Harmon Kardon speaker and integrated Amazon Alexa support (my preferred digital assistant for home automation). The device is rounder in design than the classic Orbi router and features a smart-looking metallic stripe on top of its molded base. It’s attractive and consumers will likely have no qualms with displaying it on a shelf or kitchen counter. In my testing of the product, the audio quality was spectacular—on par, in my opinion, with Apple’s HomePod (which I reviewed here), and even louder, without distortion. Additionally, its useful Amazon Alexa support stands in contrast with HomePod’s less-than-stellar Siri implementation. Available at $299, it is $50 less expensive than the HomePod. One drawback is that the Orbi Voice is not a standalone product—it is part of the Orbi ecosystem and is targeted at existing Orbi customers or those customers wishing to add a mesh networking solution to their home. Netgear also offers the Orbi Voice in a paired configuration with a second satellite for $429—not an unreasonable price considering it will provide a robust mesh networking capability that extends WiFi coverage throughout homes up to 4,500 square feet. In addition to Alexa support, the Orbi Voice also supports music services like Amazon Music, Pandora, Spotify, and iHeartRadio. Orbi Voice is a great way to bring mesh networking to your home with the added convenience of Alexa support and truly terrific audio. It’s worth checking out. The HiMirror Mini smart mirror solution. CAL-COMP BIG DATA, INC.
Here’s a product that just makes sense. 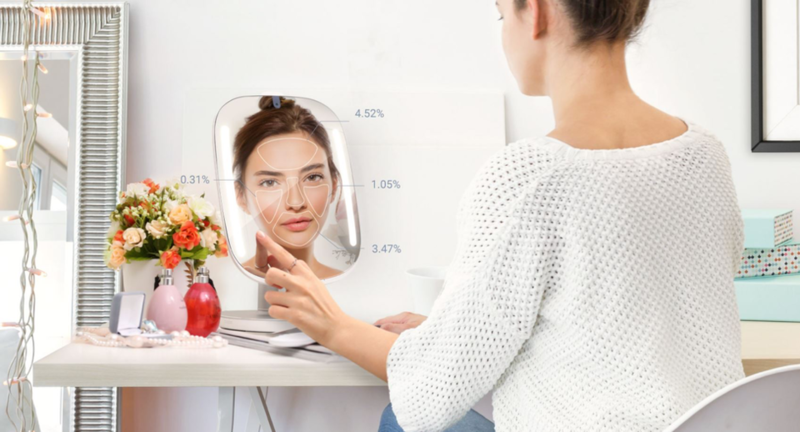 Cal-Comp Big Data, Inc.’s HiMirror Mini is a connected “smart” mirror that sits on the counter of your bathroom and uses an integrated camera to analyze your skin, track your skincare goals, and monitor the effect of beauty products that you are using. At only 13.3” x 9” (including a table stand) and weighing less than 4.2 pounds, HiMirror Mini is smart looking and compact and does not look dramatically different than the standard 10” makeup mirror many already have in their bathrooms. What sets it apart from other conventional bathroom mirrors is that it has integrated Amazon Alexa functionality, adjustable LED makeup lights, a touchscreen, and the aforementioned camera (which also has magnifying functionality). The camera features a cover that can be easily slid across the lens for complete privacy. The HiMirror Mini’s camera technology provides detailed skincare analysis based on how your skin evolves. It factors in weather conditions and more, monitoring wrinkles, fine lines, complexion, pores, red spots, and dark spots. All of these conditions are measured and tracked, assessing the effectiveness of the skincare products you are using. 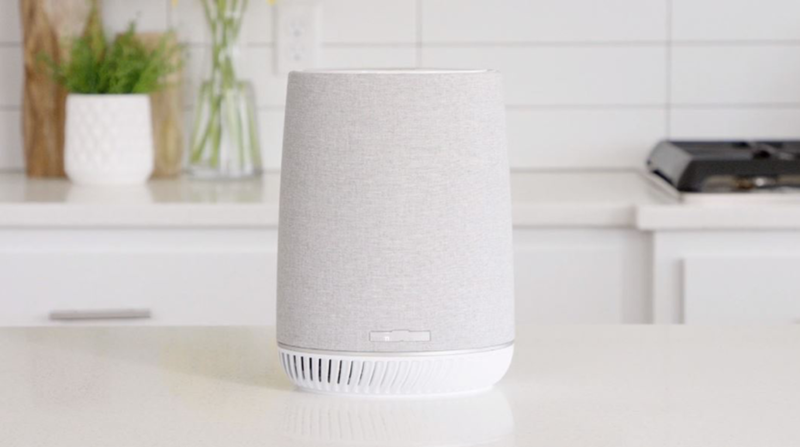 For me, the coolest feature of the product is the built-in Alexa functionality, with the ability to connect to Spotify, YouTube, Facebook, and Instagram. While the embedded 4-watt speaker is not going to make you forget about higher end speakers, it’s totally acceptable for listening to music or news in the morning. The only issue I had with HiMirror Mini (albeit not a deal-breaker) is that its 2X and 3X digital magnification is not as sharp as I’d like it to be (at least compared to a conventional mirror). Other than that, I found it to be extremely useful to have something like this in the bathroom. At only $119 and available via Amazon, it’s bound to make someone in your household very content. Logitech has an enviable reputation for being one of the most innovative companies on the planet. Known for its high-quality accessories and peripherals, Logitech sets the benchmark for designing some of the best human interface devices on the market. Logitech’s MX Vertical Mouse is a case in point. In a sense, the MX Vertical Mouse reminds me of the way 7-Up used to describe itself as the “Un-Cola.” The MX Vertical Mouse positions itself as a mouse that reduces strain and movement through an ergonomic, vertical form factor. Logitech claims that the design can reduce muscular activity by 10 percent compared to a typical mouse. It incorporates high-resolution sensors that support up to a 4,000 DPI, which minimizes the need to physically move the mouse as much. Logitech being Logitech, the design incorporates a dedicated button on the top of the product that allows users to easily change between lower and higher DPI settings with just a simple single press. You also have the option the drag the mouse for significantly finer adjustments. I’ve been using the MX Vertical for about three weeks and the transition to it from a standard mouse was easier than I expected. It wirelessly connects to your PC via Bluetooth and pairing was a breeze. 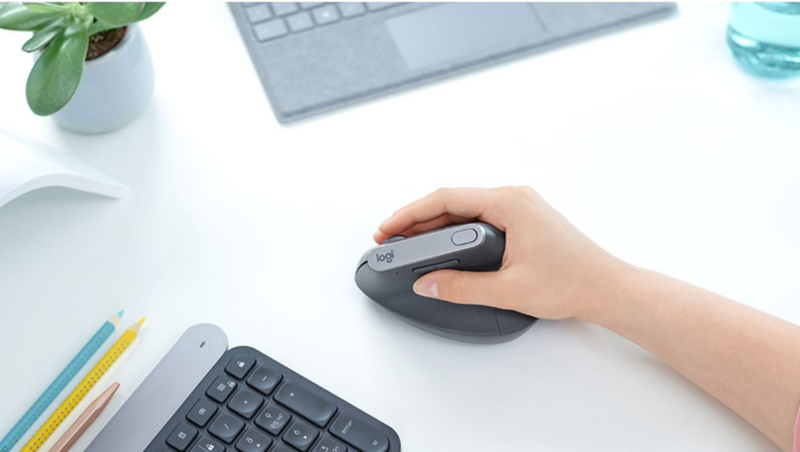 It will take you some time to adjust to it, but if you’re looking for an alternative to a standard mouse (or even notebook trackpad) to reduce wrist fatigue, without sacrificing pointing accuracy, the rechargeable MX Vertical should definitely be on your radar screen. At $100, its premium design is well worth the price. If you’re an Apple iPhone X or iPhone 8 owner, a less ambitious but incredibly useful accessory that should be on your shopping list is the Logitech POWERED Wireless Charging Stand. Priced at $70, its beautifully clean design might fool you into thinking that it’s an Apple product. 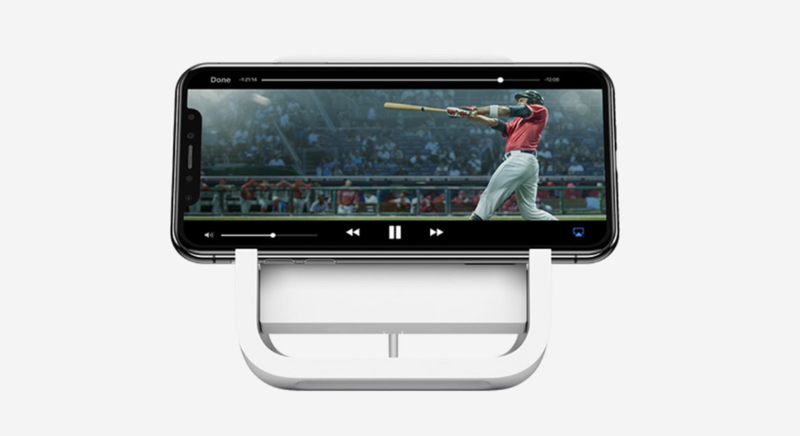 The entire pad takes full advantage of the inductive charging support that is embedded in the iPhone 8 and iPhone X-class models, allowing the iPhone to be charged in a vertical or horizontal manner (the latter being ideal for video playback). The charging pad’s small “lips” at the sides and bottom allow the phone to make a secure connection with the inductive charging surface, and the pad is wide enough to accommodate most case covers. The only negative comment that I have about the product is that it uses the slower (Apple-supported) 7.5W wireless charging standard so it won’t terribly useful for non-iPhones that utilize the higher QI-class charging spec. However, if you’re looking for a good-looking charger that allows you to watch video in landscape while the phone is charging, the POWERED Wireless Charging Standard could be just the ticket. Concluding my roundup of great smart home accessories that every smartphone-equipped family should consider is the PhoneSoap 3 Sanitizer. Smartphones carry a lot of bacteria due to their constant usage, and most people don’t take the time to clean them properly. Even if you wash your hands on a regular basis, smartphones routinely, unknowingly come into contact with germs and bacteria. According to researchers at the London School of Hygiene & Tropical Medicine, the average smartphone has 10 times the level of bacteria than a typical restroom. Yikes! Enter the PhoneSoap 3—resembling a large case with a small tanning bed, it is big enough to cover the largest smartphones on the market (including the newly announced iPhone XS Max). 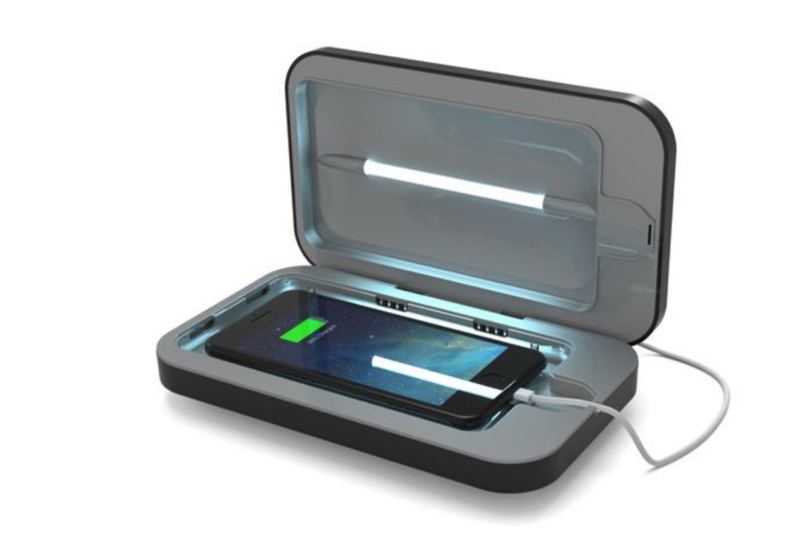 The PhoneSoap 3 incorporates UV-C emitting lightbulbs that kills germs in just 10 minutes, without having to resort to damaging heat, liquids, or chemicals. You can even use it to sanitize other household items like keys, money, or credit cards. PhoneSoap claims that the embedded lightbulbs have a lifespan of 4,000 hours, which equates to 24,000 cleanings before the bulbs burn out. The $60 PhoneSoap 3 also offers an integrated USB port so that you can charge your phone while it’s being sanitized. Going even further, a new PhoneSoap Wireless model(available in November at $100) has an embedded inductive charging pad for wireless charging. This product may not guarantee that you and your family won’t get sick this coming flu season, but it will definitely lower the odds. These are just a few of the smart home products and accessories that showed up on my doorstep over the past couple of months. I tend to only cover products that I believe solve real problems—unfortunately, there are many gadgets on the market that are instead “solutions” in search of a problem. Over the next couple of weeks, I will continue to cover other tech products that should be on your radar this holiday season—stay tuned.